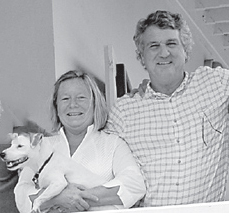 Liz and John Ford in 2009 outside the three story building they built in Coral Bay opposite the Romeo Company Fire Station, U.S. Virgin Islands. John Ford shared a love of adventure with his family, on land, at sea and in the air. It was fitting to some of those who knew him that his last moments were spent practicing to perform in an air show. The performance group is called RedStar Fly. For the past twenty years the group, made up of about 40 planes and pilots, has put on an annual air show at the Ware County Airport. Ford was described as a skilled pilot. On October 21, 2016, about 1430 eastern daylight time, an experimental Nanchang CJ-6A airplane, N10EB, impacted terrain near Blackshear, Georgia, after a midair collision while maneuvering in formation with another experimental Nanchang CJ-6A airplane, N33CY. The private pilot of N10EB was fatally injured, and the airplane was substantially damaged by impact forces and a postcrash fire. The airline transport pilot and the passenger aboard N33CY were not injured, and the airplane sustained minor damage. Both airplanes were privately owned and operated. Both flights were being operated under the provisions of Title 14 Code of Federal Regulations (CFR) Part 91 as personal flights. Visual meteorological conditions prevailed at the time of the accident, and no flight plan had been filed for either of the local flights, which departed from Waycross-Ware County Airport (AYS), Waycross, Georgia. The formation flight was a part of an event organized by the Red Star Pilots Association. One purpose of the event was for the association's members to practice their formation flying skills. The two accident airplanes were part of a four-airplane formation, with N10EB in the No. 3 position in the formation and N33CY in the No. 1 (lead) position. The formation flight was conducted with two other Nanchang airplanes and involved a "fingertip strong" left formation, in which there are an even number of airplanes in formation, the left side of the formation has an extra airplane on the left (outside) when looked at from above. For the formation flight, the call sign "Bama" was used. Bama 1 was the lead airplane, and Bama 2 through 4 were the second through fourth airplanes in the formation, respectively; Bama 1 and Bama 3 were the airplanes involved in the midair collision. Bama 1 had a passenger in the rear seat, and Bama 2 and 4 each had a safety pilot in the rear seat because the Bama 2 pilot was in a training status and the Bama 4 pilot was receiving a "recommendation ride" for formation proficiency. The Bama 1 pilot stated that the Bama 3 pilot had proficiency status for the formation flight. About 1400, the four airplanes took off in staggered 15-second spacing. The airplanes departed the traffic pattern to the northeast where they began several different formation maneuvers, including pitch-outs and subsequent rejoins. The accident occurred during the fourth pitch-out and rejoin maneuver of the day. The airplanes in the formation had successfully executed three pitchouts and rejoin maneuvers. During the fourth rejoin maneuver, at an altitude of about 2,500 ft mean sea level (msl), Bama 1, the lead airplane, was established in a standard-rate right turn, and Bama 2, after maneuvering inside of the turn, was positioned aft and to the right of Bama 1. Bama 3 was expected to maneuver toward the left formation spot on the outside of the turn and off the left wing of Bama 1 (see figure 1). Bama 4 was following about 1,000 ft behind Bama 3 and had not yet performed his rejoin maneuver. 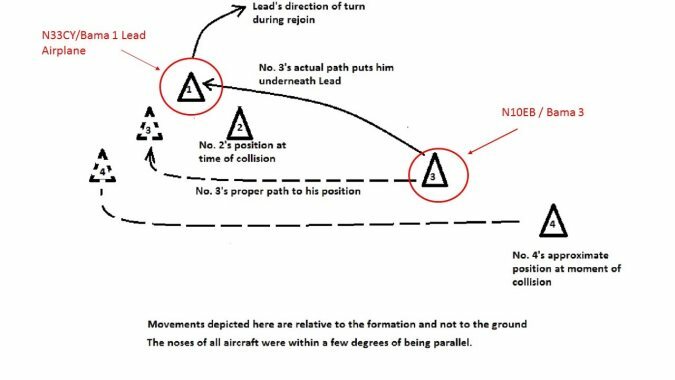 The Bama 1 pilot reported that he saw Bama 3 approaching from the right at an acute angle (forward of the desired bearing line and at a high aspect angle), at a high rate of closure, and the pilot was not adjusting the airplane's flight path. The Bama 1 pilot announced on the radio, "Bama  you are overshooting. Take it to the outside!" The Bama 1 pilot further reported that Bama 3 had "disappeared under my [airplane's] right front." The Bama 1 pilot then looked to the left because he expected to see Bama 3 emerge from under his airplane and continue the lateral movement outside of the formation's turn, but instead the collision occurred. 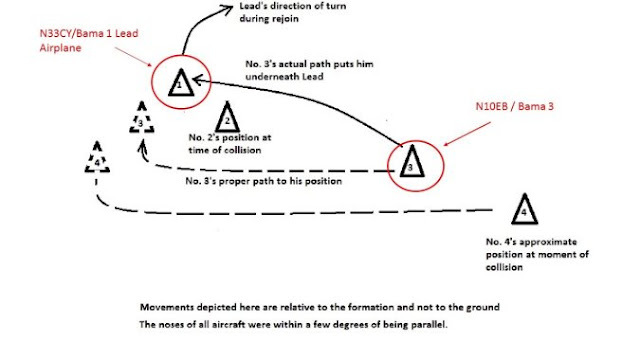 Bama 1 pilot's depiction of the formation of airplanes before the accident. Red annotations added for clarity. The Bama 2 pilot reported that, during the rejoin maneuver, his airplane was positioned off of Bama 1's right wing. The Bama 2 pilot stated that he heard the radio call "underrun" and then saw Bama 3 below Bama 1. The Bama 2 pilot also stated that the Bama 3 climbed steeply and impacted Bama 1. The Bama 4 pilot reported that, when his airplane was about 1,000 ft from the other airplanes in the formation, he saw Bama 3 suddenly pitch up and then saw that the airplane's horizontal stabilizer had separated from the fuselage. Following Bama 3's impact with Bama 1, the entire tail of Bama 3 separated. Bama 3 then pitched down, entered uncontrolled flight, and impacted terrain. After the collision, Bama 1 maneuvered toward AYS and landed safely. The Bama 3 pilot, age 65, held a Federal Aviation Administration (FAA) private pilot certificate with an airplane single-engine land rating. He held an FAA third-class medical certificate with the limitation to wear corrective lenses. His most recent medical examination occurred on July 9, 2015, at which time he reported 1,020 hours total flight experience and 50 hours during the last 6 months. The pilot's logbooks were not recovered. The Bama 1 pilot, age 67, held an FAA airline transport pilot certificate with airplane single- and multi-engine land. He also held a flight instructor certificate with a rating for airplane single-engine. He held an FAA second-class medical certificate without any limitations and reported 18,500 hours total flight experience on his FAA medical certificate application dated June 23, 2016. The pilot also reported 61 hours of flight experience in Nanchang CJ-6A airplanes with 13 and 3 hours in the previous 90 and 30 days, respectively. At the time of the accident, both the Bama 3 and Bama 1 pilots were qualified as a Formation and Safety Team (FAST) cardholders. The Bama 3 pilot had qualified as a FAST wingman in 2007. The Bama 1 pilot had qualified as a FAST wingman in 2004 and as a FAST lead pilot in 2010. According to the FAA, pilots who possess FAST cards "have received sufficient training and have been evaluated to conduct formation flying in a safe manner." The Bama 3 airplane (N10EB) was manufactured in 1969 and contained a Vedeneye M14P 360-horsepower radial engine and a wooden three-blade constant-speed propeller. The airplane received a special airworthiness certificate, experimental exhibition, on August 12, 2004. The Bama 3 pilot purchased the airplane on August 9, 2004. At the time of the airplane's last annual inspection on November 18, 2015, the airplane had accumulated a total of 3,760 hours on the airframe and a total of 1,011 hours on the engine. The Bama 1 airplane (N33CY) was manufactured in 1985 and contained a Housai HS-6A, 285-horsepower radial engine and a metal two-blade constant-speed propeller. The airplane received a special airworthiness certificate, experimental exhibition, on October 6, 2008. At the time of the airplane's last annual inspection on September 16, 2016, the airplane had accumulated a total of 3,122 hours on the airframe. The total number of hours that the engine had accumulated since the last annual inspection could not be determined from the available evidence. Both airplanes were low-wing designs of semi-monocoque construction with tandem seating under a bubble-top plexiglass canopy windscreen. The AYS 1415 weather observation indicated the following: wind from 320° at 12 knots, visibility 10 statute miles, clear sky, temperature 28°C, dew point 12°C, and altimeter setting 29.79 inches of mercury. AYS was a public, nontowered, uncontrolled airport located 3 miles northwest of Waycross, Georgia. AYS had three asphalt runways, 01/19, 05/23, and 13/31. Communications on the CTAF/UNICOM for AYS were not recorded at the time of the accident. The Bama 3 main wreckage was located in a dirt field about 8 miles northeast of AYS. All sections of the airplane except for the empennage, which was missing aft of the vertical stabilizer fairing, were found in the main wreckage debris field. The empennage came to rest about 1,200 ft southwest of the main wreckage. The nose of the airplane was oriented on a 35° heading. All major structural components of the airplane were accounted for at the scene. The airplane sustained significant compression damage during ground impact. The bottom of the airframe was flattened, and buckling was observed throughout the entire fuselage and on both wings. The engine remained attached to the firewall. The propeller assembly remained attached to the engine at the crankshaft/propeller flange junction. The propeller blades were shattered about 9 inches from the spinner, and fragments of the blades on both sides of the propeller arc were found up to 25 ft from the wreckage. Examination of the engine and the propeller revealed no evidence of mechanical malfunctions or failures that would have precluded normal operation. The left and right wings remained attached to the fuselage and exhibited span-wise buckling. The fuel tanks remained intact, and about 25 gallons of fuel remained. During impact, the header fuel tank behind the engine ruptured, resulting in a post accident fire that consumed the cockpit area, including instrumentation, gauges, and switches. The control surfaces remained attached and control continuity was confirmed by operation of both left and right ailerons through the forward and aft control sticks. Rudder control continuity was confirmed. All rudder cables showed evidence of overload and were traced to their respective locations in the tail assembly and through the fuselage to the rudder pedals. Flight control continuity was verified from the respective flight control surfaces to the cockpit. The left vertical stabilizer, left elevator, and rudder all showed signs of propeller blade strike damage. There were blade strike impact marks on the fuselage 12 inches aft of the vertical stabilizer fairing; a slice about 24 inches long propagated the entire diameter of the fuselage. The Bama 1 propeller had numerous gouges and scrapes along the length of both propellers blades, with one propeller blade exhibiting gouging that penetrated ¾ inch into the leading edge of the propeller. Both propeller blade tips were curved slightly outward. Paint transfer marks in dark blue and red (the colors of the Bama 3 airplane) were observed on the propeller. In addition, about 4 ft from the right wing root, there were several scrapes and a dent on the top side of the right wing leading edge that appeared along with dark blue paint transfer marks. The Georgia Bureau of Investigation, Division of Forensic Sciences, Decatur, Georgia, performed an autopsy of the Bama 3 pilot, and the autopsy report stated that the cause of death was multiple injuries. The autopsy report noted an area of 50% stenosis in the proximal left anterior descending coronary artery. The FAA's Bioaeronautical Research Sciences Laboratory, Oklahoma City, Oklahoma, performed toxicology testing on the Bama 3 pilot. No carbon monoxide or ethanol was identified. Tetrahydrocannabinol (the active component in marijuana) was identified in lung and cavity blood, but the amount could not be quantified. The laboratory can quantify amounts of THC that are at least0.001 µg/ml. THC's inactive metabolite, tetrahydrocannabinol carboxylic acid, was identified at 0.0487 ug/g in lung and at 0.0071 ug/ml in cavity blood. Once all the wingmen have called in position, the flight leader will rock his wings to initiate the rejoin, and then begin a turn in either direction, using approximately 25° to 30° of bank. The flight leader will maintain a constant bank, a constant airspeed and a constant altitude while the wingmen maneuver to rejoin. If rejoin airspeed has not been briefed, or if Lead is not within 10 knots of the briefed rejoin airspeed, Lead will make a radio call announcing the airspeed. Once the rejoin has been initiated, wing pilots can expedite the rejoin by accelerating and holding up to 10 knots or +10% of additional airspeed. Push up the power. The goal is to add a minimum of 10 knots or +10% of the leader's rejoin airspeed as expeditiously as possible. Determine position inside or outside of the leader's turn circle (TC). If the leader's AA remains stable with an increasing LOS rate, the wingman is inside the TC. If the Leader's AA continues to increase with a low LOS rate, the wingman is outside the TC. If inside the turn circle, start pulling lead pursuit to capture and maintain the rejoin bearing line. Check airspeed and stay as close to the leader's altitude as possible. If the rejoin is stable approaching route position, continue into fingertip to complete the rejoin. If outside the turn circle, get to the TC ASAP by flying toward the reference point on the horizon where the leader started his rejoin turn. This will preserve turning room and prevent an uncontrollable, very acute rejoin. When the leader's AA stabilizes, and the LOS rate starts increasing, the wingman is inside the turn circle. Now, the wingman should proceed with Step 3 and complete an inside the TC rejoin. Number 3 and #4 must complete their rejoin to the corresponding fingertip position on the outside of the leader's turn circle. If these wingman approach route position with a stabilized rejoin, they should maintain their overtake and simply perform a cross-under to their corresponding position. As the overtake rate increases, wingman should cross-under farther back to give themselves more time outside the leader's turn circle to dissipate excessive overtake. With the 4-ship rejoin, there are two additional aircraft in motion, moving up the bearing line toward Lead. When executing individual rejoins, such as after a pitchout, the wingmen will "join by the numbers." In other words, each wingman will join on Lead, in turn. As an example, #4 will not join on #3 before #3 has rejoined with Lead. This allows #2 to overshoot, if required, and gives #3 and #4 time and space to react to this overshoot and preserve their ability to complete their own rejoin. There is no signal for an overshoot, however, the wingman will make a radio call to advise the flight leader that he is executing the overshoot ("Bigdog 2, overshooting"). Once #2 has completed the rejoin via the overshoot, #3 and #4 can recommence their rejoins. Both should pull lead to reacquire the bearing line, push up the power, and descend, if required, to keep sight of the lead element. Now, they both complete their rejoins by flying Step 5 and 6. If #3 has excess Vc [design cruise speed] and cannot move directly into the fingertip position on the outside of the turn, he can use reduced power, speed brakes, and fly a wider echelon or fingertip position until his Vc allows him to slide into normal fingertip position. Number 4 should not complete his rejoin until #3 is in fingertip. Number 4 can use the same procedures if excess Vc needs to be dissipated. Number 3 and #4 must not be overly aggressive dissipating Vc and hurry to get into position. They must use the same care completing their rejoins as #2 does when using overshoot procedures. • Wingman will recognize the excess closure in a timely manner and in a smooth, controlled maneuver, execute the overshoot. • Number 3 and #4 will delay their rejoins, as required, to keep #2 in sight and give him time and space to complete the rejoin via the overshoot. • If #3 and/or #4 need to dissipate excess Vc, they will do so in a controlled fashion on the outside of the leader's turn. • Number 3 and/or #4 not giving #2 enough time or space to complete the rejoin via the overshoot. • Number 3 and/or #4 dissipating excess Vc on the outside of the turn in an overly aggressive manner. Overshoot maneuver depicted in Red Star Pilots Association formation manual. The figure represents a left-hand turn and does not represent the accident formation flight. Another fatality involving a pilot with THC in his system. I understand that if THC is found in the lung, that means it was smoked fairly recently. Hey, lets get high then fly a plane in precision formation with other planes at 150 kts! Insanity at it's finest, but what's worse is that the MSM pushes its use as if it's as safe as drinking a warm glass of milk before bed. When is the public going to wake up to it's dangers OR is that their plan to keep the population drugged up and dumbed-down so we just go along and not ask questions. The metabolic 1/2 life of alcohol is 4 hours. The metabolic 1/2 life of THC is 11 days. I can have a beer or two, get a good night's rest and be alert on the job the next day.